♣ Between 1970 and 1995, the Hershey Chocolate Company in the United States reduced the weight of its chocolate bars fifteen times, but raised prices only four times. ♣ In the US in the 1950s, the average candy bar cost $0.05c. By 1983, this had risen to $0.35c, with prices increasing in 5 cent increments. Typically, the size of the bar increased at the time price increase, but it was later reduced before the next price increase. ♣ Finally, there is the example of Mars, and what it did with Britain’s biggest selling chocolate bar in 2002: it whipped the bar’s nougat in a different way, which reduced its weight from 65g to 62.5g, while leaving its price unchanged at £0.29. All of the above historical and current examples have involved and reduction in volume and no change in price. 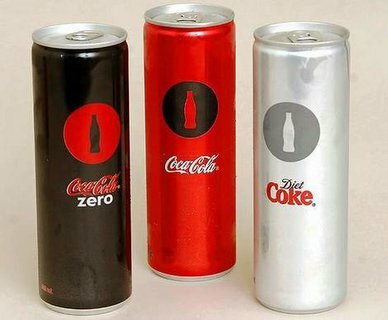 Coca-Cola however have done something different however: in launching the new 300ml cans shown above, they have both reduced volume (from 375ml to 300ml) and increased price (from $1.50 for the 375ml cans, to $2.00). According to press reports, Coke’s change in pricing and packaging is based on market research and factors such as downsizing by health conscious Australians and helping parents control the portions given to children. Fact or Fiction? Who knows? And what about the Red Bull factor – the size of the can bears an uncanny resemblance to the size of a Red Bull can. And in the US, the average price of a 288 ounce case of Red Bull yields a price of $69.45, compared to $18.08 for Cherry Coke and $9.41 for Coca-Cola. Would you miss 2.5g of a Mars Bar? Will you buy 300ml slim-line cans of coke for $2? Post your thoughts below. Perhaps this is something people involved in pricing in Zimbabwe could try - at least it wouldn't get them arrested for increasing prices. Readers of this blog may recall my posting on 19th May this year regarding the rising price of copper which is used in 2p coins in the UK. Americans For Common Cents, who believe that 70% of Americans want to hang onto 1c coins. Its great to see that competition is alive and well in America! Here's an interesting price tag. My wife recently puchased a blouse at (the house of) Target, on sale, for only $5.04. When she told me the price, I thought she was kidding. Why would a retailer price at $5.04 rather than say $4.99? One of the reasons put forward for the use of price points ending in 99c is that the shop assistant had to open the till to give the customer back a penny. This prevented them pcoketing the proceeds of the sale. That is not a reason in this case: one cent coins were removed from circulatation many years ago now, so had my wife paid with a five dollar note and a five cent coin, both could have found their way into the assistants pocket without a "where's my change query?" from the shopper. Of course, the other possible explaination is that the $5.04 price point has been recommended by some sort of pricing or markedown optimisation software used by Target.